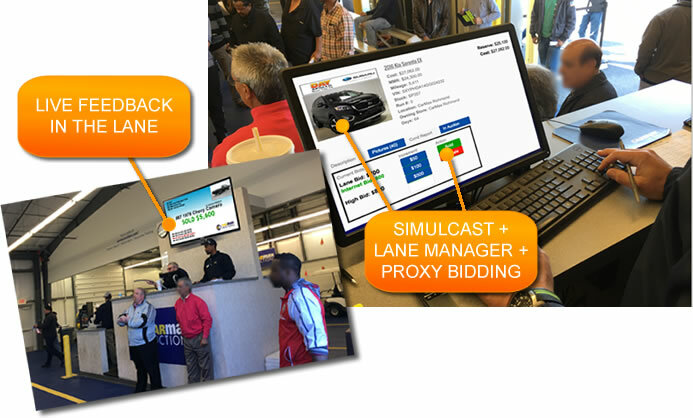 PHILADELPHIA - July 11, 2016 - PRLog -- Auction Simplified, a Buffalo-based provider of online vehicle auctioning systems for automotive dealers, captives, consigners and independent auctions, announced today their latest feature, HD multi lane simulcast. The enhancement is especially designed for independent auto auctions and franchise dealer groups already holding traditional lane sale auctions. Auction Simplified's VP and Co-Founder Kevin B. Leigh made the announcement in Philadelphia, PA.
"Up until now we focused on helping dealers start their own auction, with the addition of lane manager in March and now, HD Simulcast, we can help traditional lane auctions reach a higher standard," said Kevin at the announcement at the historic Joseph Ambler Hotel. HD-simulcast allows buyers a clear view of the car in the lane. They can zoom in and see a level of detail not possible with most simulcast systems. "We spent months perfecting the next generation simulcast, practically eliminating delays. But the most important feature is that it does not require the bidders to download complicated software. It truly is Simulcast Simplified," said Kevin. "With the addition of live auction + HD-simulcast software, we believe Auction Simplified can now provide every type of auto auction to our customers: Lane Sale, Simulcast, Proxy Bid, Open Bid, Silent Bid, Make an Offer, Overnight Appraisal, Broadcast Appraisal and Buy-Me-Now," said Phil Gates, CTO and Co-Founder. For more on Auction Simplified, go to www.AuctionSimplified.com or Call 877-877-4511.